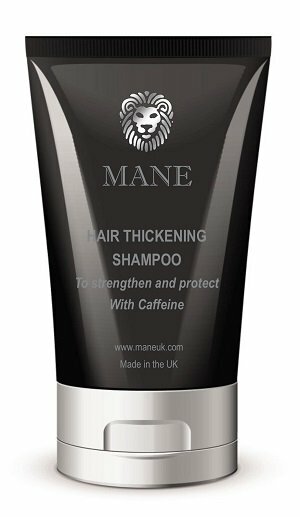 Mane Hair Thickening Shampoo has been specially created with a new and unique formulation which will help to thicken and strengthen your hair – leaving you feeling like you have a fuller head of hair. There is also a selection of special ingredients that will help to stimulate your hair follicles and so promote the growth of new hair. Root Extract from Loveyly Hemsleya – known to reduce the formation of DHT – a cause of hair loss. Apigenin – known to improve the flow of blood to follicles which will help to re-start hair growth. Biotinyl – GHK – known to strengthen the hair follicles’ roots which will help to stop hair from falling out. In clinical trials it improved hair growth by 70% more than Minoxidil. Proven anti-ageing properties and hair re-growth. Procapil – fortifies and rejuvenates hair follicles. Anchors hairs by strengthening follicle metabolism and structure. Wheat proteins – which will add body. Panthenol and Glycerin – will sooth and moisturise. Climbazole – which has anti-dandruff properties to keep the scalp healthy.